The beautiful artwork created for Fermob by Leona Rose. New colours, new collections, new products - discover it all! Once again Fermob produced a fabulous stand to showcase their new colours and products for the coming season. 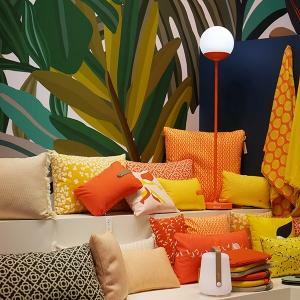 With a beautiful artwork in all the Fermob colours and new products literally climbing the walls it was typical of the Fermob spirit of joie de vivre. Watch the Fermob video below and discover it all! There are so many new products and collections on the way! We'll be sharing specific details on everything via our newsletter over the coming weeks - sign up for all the details. In the meantime if there is anything you spot in the video that you'd like to know more about just get in touch.